You are one step away from receiving my yummy updates! Check your inbox to confirm your subscription and.. voila! Let’s get baking! Thanks for stopping by! If you love all things sweet, creative and delicious then you have come to the right place! If you're like me and love crispy, buttery crumble, beautifully baked apples and a hint of salted caramel, then you will want to have a bite of this yummy Salted Caramel and Apple Slice. Well here it is guys! Want the perfect recipe for a deliciously moist chocolate cake? Then look no further than here! I bring you my Ultimate Chocolate Cake! 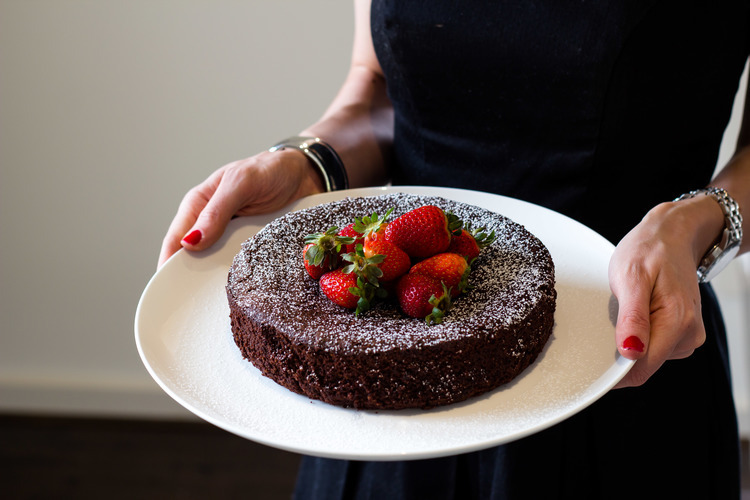 This simple chocolate cake recipe is definitely a crowd pleaser, and in my opinion is the best chocolate cake recipe ever. Read on to find out how to master sweet shortcrust pastry, and get my delicious recipe for these gorgeous Raspberry Tartlets! This basic focaccia recipe can be adapted with any type of topping you like! Other flavour ideas include roasted cherry tomatoes, caramelised onions, roasted red capsicums, cheese and salami. Focaccia can be served as a side to soups or casseroles, with an antipasto platter, cut in half filled with roast vegetables or cured meats, or on its own! With Autumn at its peak, I wanted to take advantage of fresh figs in season and make this gorgeous honey-infused fig and mascarpone galette. Figs and mascarpone go incredibly well together, and the honey helps to enhance the sweet, luscious flavour of the figs. Read on to get the recipe for this yummy, Autumn-inspired galette! How to Make Light and Fluffy Scones - Everytime!! If you're after a recipe for the best light and fluffy scones, then look no further than this recipe! The Best White Chocolate and Macadamia Nut Cookies! What makes a perfect cookie is one that is soft and chewy on the inside, but a slight crunch on outside, and these White Chocolate and Macadamia Nut Cookies are just that. These delicious and refined sugar-free bars are so quick and easy to make - I can usually mix them together on a Sunday evening, ready for "lunch-box" snacks for during the week. I usually don't defer from the traditional Anzac biscuit recipe, but I decided to jazz them up a bit here, and what better way to do that then by spreading a thin layer of dark chocolate on the base!